Life rushes by at the speed of light if you let it. We’re obsessed with making everything faster, less time consuming and more efficient so that we can cram more in, but does this defeat the purpose? I have been guilty of this for as long as I can remember and it was inevitable that this disposition would filter through into my journey, my progress in recent weeks is evidence of that. What happens when you slow it all down? Do you miss out? Or do you get more out of less? 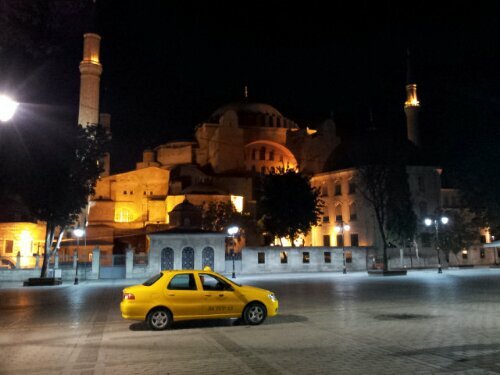 Reaching Istanbul marked another milestone, 3000 miles from home. Somehow, while travelling through the busy three-laned roads into Istanbul, Shurly Anne and I also reached a new all-time top speed of 44.9 mph. It was exhilarating dodging my way through the traffic. Thankfully I was going much slower when Shurly Anne’s, pannier covered rear end, clipped the back of a car as I changed lanes. No harm done, but I decided after that that I had ridden my luck for long enough, and headed onto the slower moving side streets. This became the new theme for the days that followed; slowing down. I surprised my Mum and Dad by meeting them at the airport in the early hours. After a brief taxi ride, and what felt like an even shorter sleep (interrupted by the morning call to prayer), we wearily caught up. It was great to see them again. 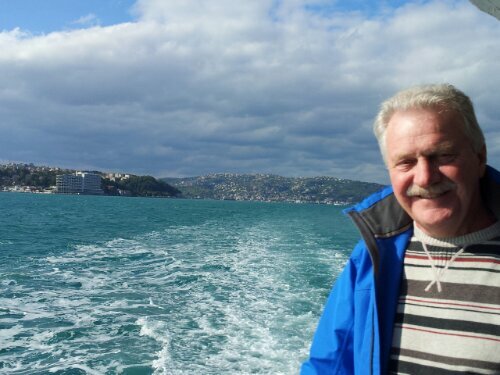 The weather wasn’t great but it didn’t stop us exploring the delights of Istanbul; the Blue Mosque, Hagia Sofia, the Grand Bazaar, the Spice Market, the Fish Market, the Golden Horn, the Cistern, a boat trip along the Bosphorous, Taksim Square, a Turkish bath (complete with massage!) and the food – the delicious Turkish food. Istanbul is a truly amazing place. It was great to slow down and take it all in. I was spoilt all week by Mum and Dad, and was very sad to see them leave. I wonder where we will meet again. Thanks Mum and Dad for a fantastic and unforgettable week. I stayed for a couple of extra days waiting, only to eventually find out that my Iranian Visa application had been unsuccessful. 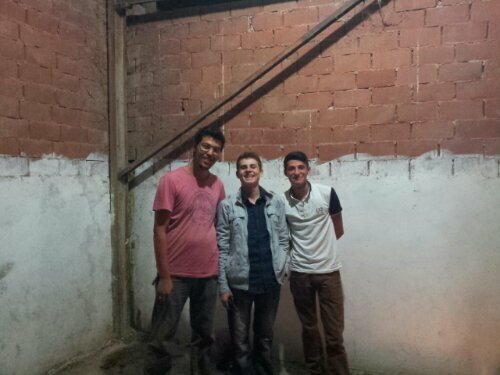 During which time I met some great people in the Taz-Manian Hostel, among which Fatih and Arife very patiently helped me learn some Turkish words and phrases. Fatih also, very kindly, showed me around Beşiktaş and treated me to some delicious kofte. This interaction started to change my experience of Turkey. With only a handful of words and phrases, the language barrier was suddenly breached sufficiently to open up the lines of communication, and with it the kindness and generosity of the Turkish people. 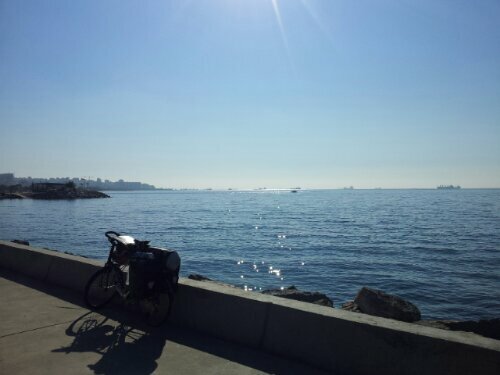 Cycling out of Istanbul along the coastline on one of the few cycle paths was a great way to get the blood flowing through the cycling muscles. Unfortunately it did not carry me all the way to Izmit, and after twenty six glorious miles I was funneled once more onto a busy highway. 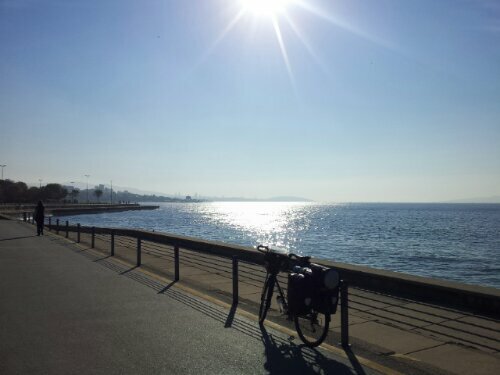 Determined to get away from these treacherous roads, my attempts to do so took me round the coast to Yalova, through the hills to Orhangazi, and back along the coast to Mudanya. A night in an olive grove at the top of one of the many hills preceded a fantastic few days back in the wild. Away from the hustle and bustle of Istanbul and the surrounding area, back in the countryside, the people were incredibly curious and friendly. Every time I stopped, someone would come to find out who the stranger with the ginger beard was and what he was doing in their town or village; it was very sweet. 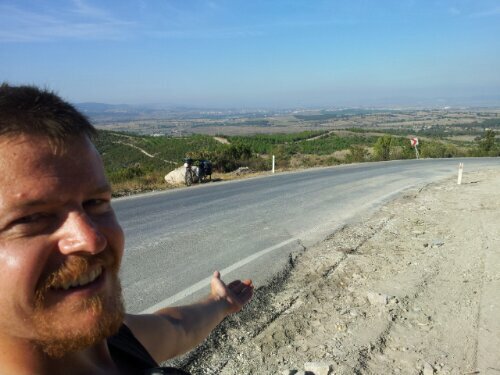 Mudanya to Karacabey was tiring and as I worked my way along a small road from Karacabey to Beyköy I found myself getting pelted in the face by swarms of flying ants. I first encountered swarms of flying ants in Croatia, but these were on a different scale. It was a miserable experience. They get everywhere; in your mouth, up your nose, in your ears, your hair, down your top, between your eyes and your glasses, and my beard was now like Velcro to the little blighters. I stopped at a little place called Hamidiye to fill my water bottles at their mosque, and was encouraged by the elders sitting outside to enter the village for tea. Although it was 4pm I resisted my natural disposition to cycle on, and as I wandered aimlessly into the square, sweating and with dead ants stuck to my forehead, a friendly chap called Kaya greeted me and showed me to where tea was being served. Within minutes we were joined by some of Kaya’s friends, and so began a wonderful evening of generosity and kindness from what seemed like half the village. First, I was invited to stay for a barbeque at 8pm, which, in the spirit of stopping to smell the roses, I willingly accepted. Then, probably due to my disheveled and ant-splattered appearance, (or perhaps it was just the smell) they asked if I wanted to use a shower. I agreed, and when I asked if there was somewhere I could put my tent for the night, they took me to what turned out to be the local town official’s working residence. It was sort of a multi-purpose building complete with office, shower, toilet, kitchen and medical examination table, which I was invited to use as a bed. After my last experience on one of those, I chose to sleep on the floor of the office, free from the uncomfortable associated memories, and potential nightmares filled with images of Doctor Macerator Hand. It was an amazing evening. Erdinc drove Kaya, Çagri and I to a local shop to get meat and bread, then to Kaya’s house to pick up the barbeque, stopping along the way to be introduced to some of his father’s cows. We then set the barbeque up in one of Çagri’s family’s empty grass stores and enjoyed barbequed chicken skewers, sausages, chilies and bread, before returning to the village to watch Turkey play Estonia at football. Turkey scored a couple of quick goals and we abandoned the game to sit with Kaya’s uncle and friends drinking Turkish tea and learning more about each other’s lives. I tried a couple of times to contribute to the evening but was told abruptly that they could not accept my money, and that it was a Turkish tradition instilled by the great Turkish leader Ataturk to embrace strangers. The next morning, the local police representative came to the town official’s residence and made me breakfast and several large cups of Turkish tea. I then joined Kaya, Erdnic and Toto (a nickname) for a couple more cups of tea in the village square, before cycling on with a sense of disbelief at what had happened; only confirmed as to be real by the massive, unstoppable smile on my face. Thank you so much for your spontaneous and tremendously kind hospitality; it was a remarkable and heartwarming experience. 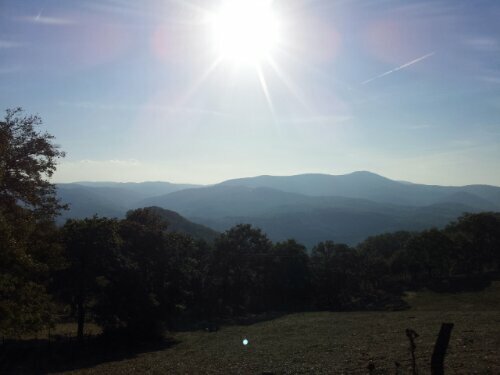 The next couple of evenings were spent camping in the hills between Gönen and Bergama. 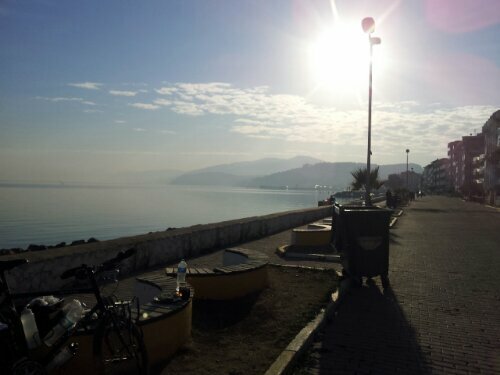 I woke early on the second morning and, after packing everything onto the bike, noticed Shurly’s front tyre was flat. 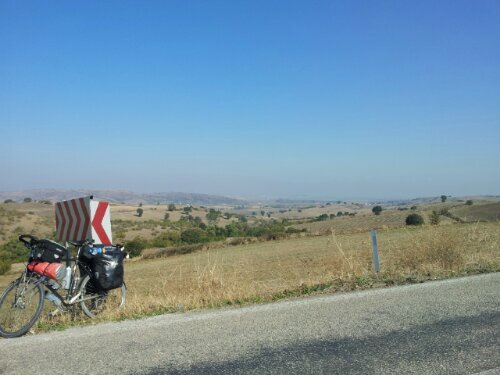 As I removed the panniers, repaired the puncture and attached the panniers again, I reminded myself to smell the roses. As it turned out, the delayed start helped to bring about another wonderful experience with a lovely young lady called Şadiye and her family, in the village of Korucu. I stopped to buy bread, honey, coffee and biscuits, and as I sat outside the last of the three stores I visited, making honey sandwiches and coffee for breakfast, I was joined by Şadiye. Her father, the owner of the shop, tipped her off that a tourist was in the village and Şadiye, keen to practice her English, came to introduce herself. We chatted for a while and laughed at the strange looks we received from those passing by, and Şadiye’s brother came to give me home made traditional Turkish bread and cheese. Then, shortly after, Şadiye invited me for breakfast with her mother Aynor, sister in law Çerin and one month old niece, Derin. It was a very sweet offer and I was delighted to accept. I felt very honored to be invited into their beautiful home and treated to delicious traditional, homemade foods: cheese, bread, the best tomato sauce I’ve ever tasted, grape molasses, a salty creamy milk based dish, fresh tomatoes and olives that had been soaked in lemon juice and salt. It was amazing, I could have eaten it all it tasted so good. I felt very privileged, and cycled on once more with a massive, unstoppable smile across my face. Thank you Şadiye, Aynor, Çerin, Derin, father and brother, for making my routine morning stop exceptional. Despite my successful transition to slowing down to smell the roses, Shurly and I still managed to reach a new top speed twice on the way through the hills to Bergama, 46.3 mph quickly followed by 46.9 mph. Maybe there is a way to live fast and stop to smell the roses; for now, however, I intend to do less and experience more. Could you be cramming too much in and consequently left feeling empty? How could you do less to experience more? Winter is a coming, and while I wait to hear back about further enquiries I have made regarding visa’s, I’ve decided to volunteer on a farm along the coast from Marmaris. Through an organisation called Ta Tu Ta I can exchange my labour for food, shelter and knowledge of ecological and sustainable farming techniques. More info to follow, but Iran could still be on the horizon after all. Thanks for reminding me of slowing down to smell the roses, I can tell how much you enjoyed it… Keep on enjoying it, Fraser… That is what really matters, isn’t it? Lovely to hear from you and yes; enjoying the moment, every moment if you can is what its all about. So easy to forget, so rewarding to remember. I hope you and the Shanghai team are all well and slowing down to smell the roses! Take good care…. and don’t tell Mark! Great idea Lisia, good luck telling Mark! Hey Mehmet, Sorry I missed you, it was great to meet you, all the very best with your move to Australia. Perhaps see you when I get there!